Elizabeth Huntley plays harp music for weddings and ceremonies, receptions and cocktail hours, corporate functions and promotions large and small in the Albany/Schenectady/Troy Capital District Area, as well as in the Saratoga/Glens Falls/ Lake George Region of New York State. 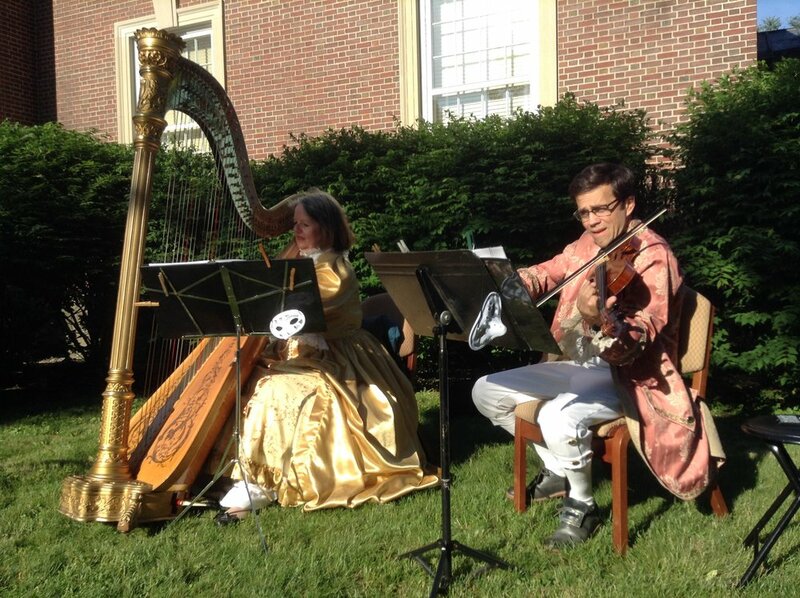 Elizabeth and Josh play for the Saratoga County Arts Council in the state park in 18th century costume. Skidmore College music faculty colleagues Josh Rodriguez and Elizabeth Huntley formed the Starlight Duo for violin and harp in the spring of 2017. Their repertoire is broad, spanning the classics, show tunes, pop and even a bit of jazz. They thoroughly enjoy the lighter side of music making and are available for weddings and cocktail hours. Both players are on the music faculty at Skidmore College, and both play with the Glens Falls Symphony, where Josh is assistant concertmaster and Elizabeth is principal harpist. On the stage of the Ladd Music Hall in the Zankel Music Building of Skidmore College. The Starlight Duo perform at an outdoor wedding.